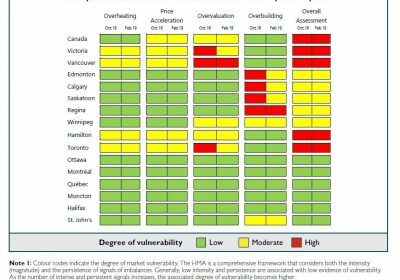 The number of Canadians who applied for a fixed-rate mortgage in August saw a substantial spike, with 59.31% of users on the LowestRates.ca website opting for a fixed-rate mortgage over variable. 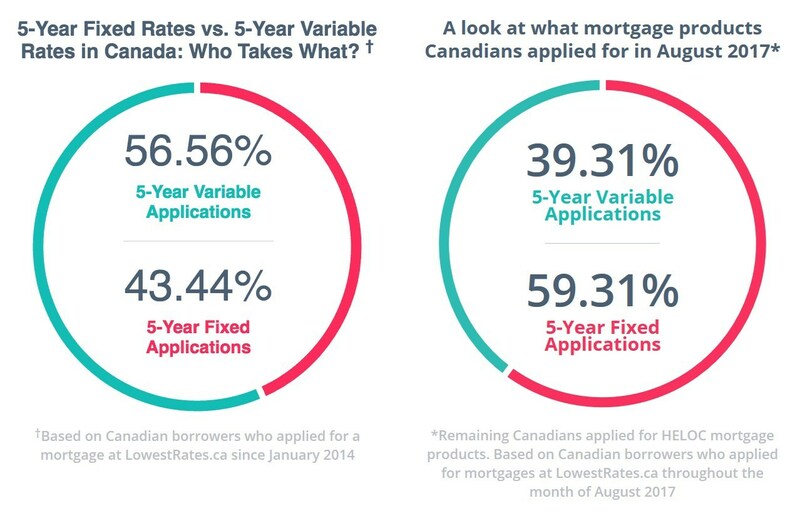 Historically, the majority of Canadians who shop for mortgage rates on LowestRates.ca opt for variable-rate mortgages. 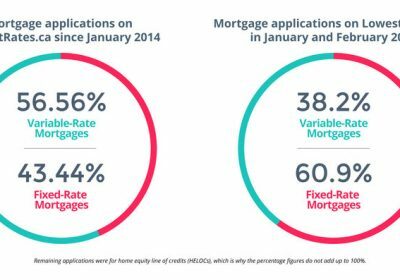 Since January 2014, 56.56% of users have gone variable, compared with 43.44% of those who go fixed. The shift in August is seen as a reaction to the Bank of Canada’s decision to raise interest rates. On July 12, the bank hiked rates by 25 basis points — the first upward move since 2010. Rates were again raised another quarter of a percent on September 6. If a consumer purchases a home for $750,000 (with a down payment of 10 per cent amortized over 25 years), at a five-year, variable rate of 1.95 per cent, they would have a total monthly mortgage interest payment of $1,096.88 (keep in mind, this does not include additional costs such as mortgage insurance, principal payment or property taxes). If the Bank of Canada increases its overnight rate by 25 basis points, that homeowner’s monthly interest payment on their mortgage would be $1,237.50 — an increase of $140.62 per month. 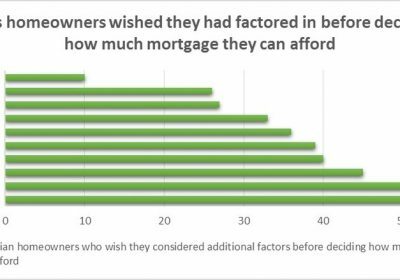 That same homeowner using a fixed mortgage rate — the most competitive fixed product on LowestRates.ca last month was 2.63% — would have a total monthly mortgage interest payment of $1,479.38. While they can lock in that rate for five years, they’re still spending $241.88 a month more in interest compared with the variable product even after variable rates go up. That’s $2,902.56 a year in increased costs! “Analysts have a wide range of opinions as to how many additional increases the BoC will make over the next 18 months, but until there is a substantial increase, the impact will be not that extreme,” says Thouin. LowestRates.ca is changing the way that Canadians think about personal finance. It’s a one-stop-shop for Canadians to compare offers on personal financial products quickly and easily from North America’s leading companies, including our partners at CAA, PC Insurance, and Scotiabank. LowestRates.ca has helped millions of Canadians explore their financial options and continues to work towards our goal of saving Canadians $1 billion in fees and interest. This article provides clear idea in support of the new visitors of blogging, that in fact how to do running a blog. yk7zbQ I want looking through and I conceive this website got some truly useful stuff on it!. and check again here frequently. I am quite certain I will learn many new stuff right here! Hi! I simply want to give you a big thumbs up for the great info you have got here on this post.